Some aspects of Australia’s environment are in good condition by international standards … Unfortunately, [this] report also shows that Australia has some serious environmental problems. Whether you read the latest 2011 State of the Environment report, or the first from 1996, many of Australia’s biggest environmental problems have remained the same. But what has changed is the scale and speed of action now needed to fix them. 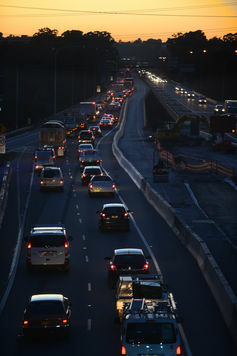 Gridlock on the M5 at 6.15am in the western Sydney suburb of Padstow. major gaps in our knowledge and monitoring across many areas. As any management expert will tell you, you can’t properly manage what you don’t measure. While most advanced nations have recognised the need to protect productive land, we continue to lose it to urban expansion, a direct consequence of the high rate of population growth, compounded by urban development policies encouraging further sprawl. That sprawl in turn contributes to one of key factors causing Australians to have the highest rate of greenhouse gas production per person of any affluent country. The very low population density of our urban areas gives us extremely inefficient urban transport systems, with inadequate public transport and a high dependence on private cars. Pressures on coastal areas also continue to be driven by our unusually high rate of population growth, augmented by social and economic changes that are driving people from inland regions. 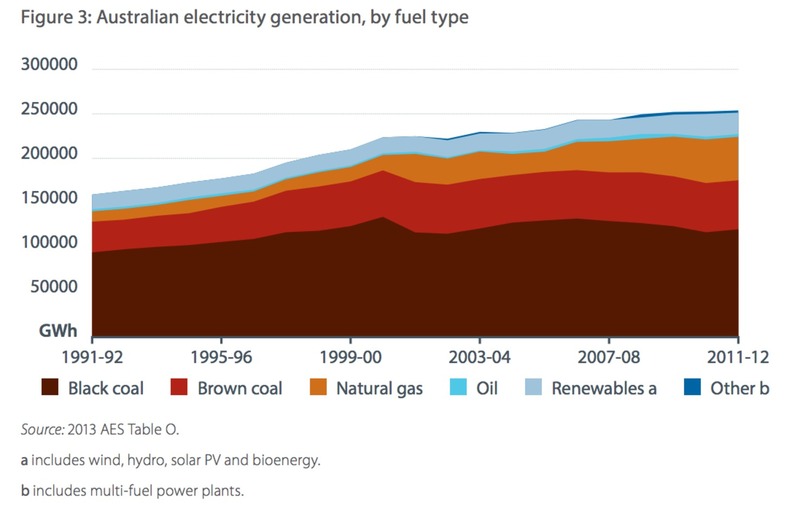 Despite the recent expansion of renewable energy systems, we still get most of our electricity from burning high-emissions fossil fuels, as shown below. Overall, our dependence on coal has fallen, but gas use has risen rapidly. And there has been no observable slowing in the rate of loss of our biodiversity, largely because the main causes have not been addressed: loss of habitat and introduced species. Our inland rivers remain a concern, especially the Murray-Darling system, largely because of the past enthusiasm for allowing extraction of river water for irrigation. So if we’ve known for decades that all of these areas need to improve, why haven’t we done more about it? During the last decade, national governments have given some attention to the symptoms of our environmental decline. The state of the Murray-Darling system is one example. Although the previous government backed away from the original plan, which would have given the river system at least a fighting chance of recovering its health, the revised document at least stopped further deterioration. In the case of our greenhouse gas emissions, the mix of policies adopted by the Rudd and Gillard governments produced a measurable reduction and we did actually meet our Kyoto target, although that is mainly because the Howard government had demanded a goal that was uniquely generous and clearly out of line with our global responsibilities. But the underlying problem is a failure to recognise and address the driving forces of environmental decline. The 1996 State of the Environment report found that the problems we faced stemmed from a growing population, increasing consumption, lifestyle, and technology choices. Yet we continue to have a rate of population growth higher than that of much poorer countries. Consumption per person is still increasing. And we continue to use outdated technologies like coal-fired electricity and large, inefficient cars. The Rudd and Gillard governments did little to address these underlying drivers of environmental problems. That was bad enough. Now, the Abbott government appears actively hostile to environmental protection. It has abandoned its responsibility for approving major projects by passing the job to the states, is trying to roll back the policies that cut greenhouse gas emissions, has reduced funding for bodies that actively protect the environment and is proposing an absurd “direct action” scheme that is not seen even by its supporters as an adequate response to climate change. The government also continues to promote ridiculously high rates of population growth, distracting attention from its policy by demonising the relatively small number of people who seek asylum here. 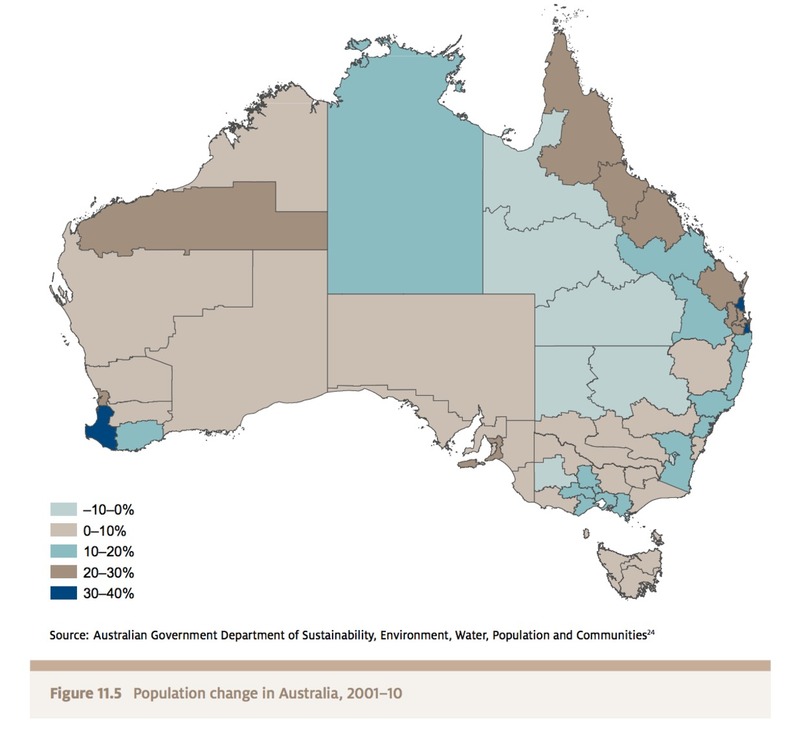 How Australia’s population changed between 2000 and 2010. Just as the Rudd and Gillard governments did, the current government is ignoring the consequences of rapid population growth. That growth is a factor in high unemployment levels. It’s also causing chaos as state governments struggle with the spiralling costs of urban infrastructure: roads, public transport, water, power and waste treatment. Our domestic greenhouse gas production is now swamped by our exports of fossil fuels, but the government continues to promote further expansion. The underlying issue is the ideology of the government, an obsession with economic growth and a studied refusal to recognise what science has been telling us for at least 40 years: it is not possible even in principle to have unlimited growth in a closed system. The continuing attempt to pursue growth at all costs will inevitably have very serious consequences. The next State of the Environment report is due in 2016. What will it conclude? I wish it weren’t the case, but I suspect it will keep repeating what has been said before in 2011, 2006, 2001 and back to 1996. Australia is still blessed with many beautiful, unique places, plants and animals, including natural wonders from the Kimberley to Kakadu, and the Great Barrier Reef to Tasmania’s wilderness. Yet as a nation, we’re still not acting to conserve the natural fortune we’ve inherited for generations well beyond the next decade. For at least the next few years, the prospects for environmental leadership from the current federal government look bleak. Nearly a generation ago, I signed off the first State of the Environment by stressing that while we had found Australia faced serious environmental challenges, most of those problems did have solutions. Today, that’s still true. But environmental organisations are increasingly seeing it as futile to attempt to persuade closed minds in Canberra. Instead, they are putting more effort into engaging with community groups and concerned citizens to change the political framework in which governments operate. Solar isn’t just for the rich. The five areas of Australia with the largest number of solar systems – Bundaberg and Hervey Bay in Queensland, Mandurah in WA, and Werribee and Hopper’s Crossing in Victoria – all have below state average income levels. Ordinary people are voting with their wallets to install solar panels and save more energy at home. Movements like Lock the Gate are the mood of the future, uniting rural producers, scientists and environmentalists to protect productive land. In the absence of national leadership, people across Australia will have to lead instead. Ian Lowe was president of the Australian Conservation Foundation for a decade, from 2004 until last month.